Highland Coffee’s Redemption Prizes Wow The Market! In today’s competitive landscape, it is important to make your company stand out from the crowd to ensure success. A great way to make your company stand out would be through redemption prizes. 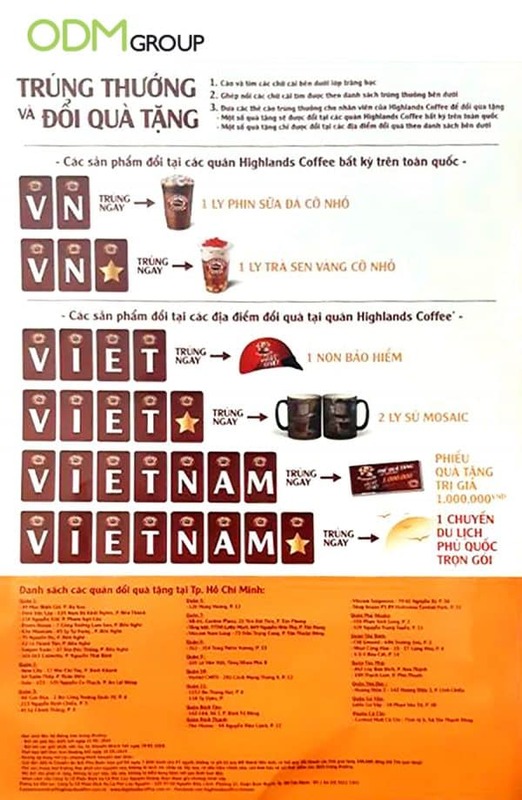 An example would be Highlands Coffee, a coffee chain in Vietnam. Highlands Coffee has effectively used redemption prizes to promote various of its coffee flavours. When a customer orders a particular coffee product, he/she would get a scratch card. The scratch cards can then be exchanged for prizes when various combinations have been achieved. Highlands Coffee promotes its redemption prize promotion through leaflets. This act as a great first point of contact from the company to the customer. Highlands Coffee has also made use of smart promotional gifts, that will surely attract customers to their brand. The gifts that Highlands Coffee have used include free drinks, a helmet, porcelain mugs, gift vouchers, and even the chance to win a free trip! Why do we like Highland Coffee’s Redemption Prizes? We like Highland Coffee’s redemption prizes because they have practical uses. For example, a motorcycle helmet as a promotional gift would be a good choice in Vietnam, as motorcycles are widespread in the country. A promotional gift mug would also be a good gift for customers, as they can use it at home, or anywhere for that matter. Why is the use of Redemption Prizes effective? Firstly, we like the use of redemption prizes because they are attractive to customers. Customers are easily enticed by add-ons, and such prizes serve as customer incentives. Therefore, they will see it as a positive add-on to their purchase, making it more likely for them to return in the future. Secondly, redemption prizes are cost-effective, and easy, to implement. This is because the promotional gifts used do not have to be exorbitantly priced, which is extremely beneficial for small companies that have limited marketing budget. 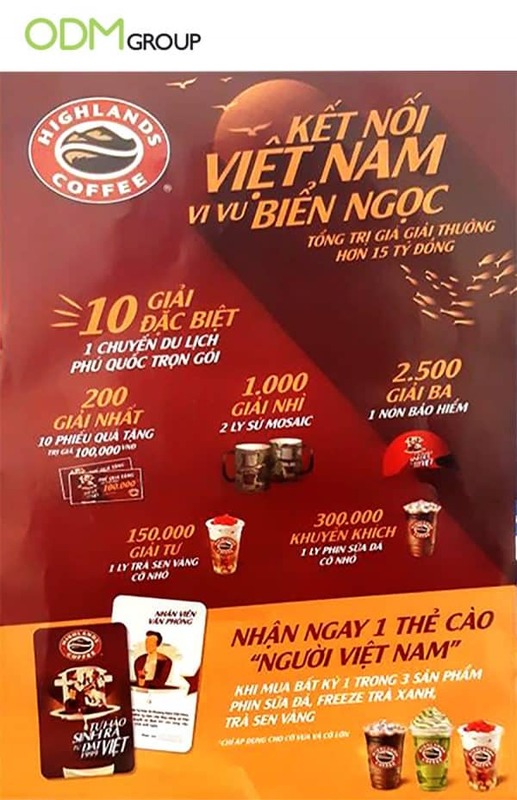 Redemption prizes, such as the scratch card prizes used by Highland Coffee, are also easy to implement, and easy for customers to understand. Here’s another redemption reward program that appeals to the masses. In this campaign, shoppers need to purchase a certain amount to earn a “happy stamp” and the redemption gifts they’ll receive will depend on the points accumulated. It was effective because it appeals to people’s competitive nature and the limited time offer also motivated them to buy more to get massive points in one single transaction. Do the gifts offered by Highlands Coffee appeal to you? If so, feel free to contact us today! Here at The ODM Group, we specialize in manufacturing promotional products and promotions. Our dedicated marketing and merchandising team will make sure that your next project is a success! Here’s an example of a contest reward by Guinness! Contest Rewards – Guinness Marketing Campaign in the U.K.
Here’s how a free gift can help boost your sales! Want to increase customer loyalty? Click here to find out how!